Concerns about honeybee populations and monarch butterfly migration have brought attention to the need to protect and support pollinators in the landscape. To understand the importance of pollinators, it is necessary to have an understanding of pollination. There are two types of pollination, self-pollination in which a plant is able to pollinate itself without outside help, and cross-pollination which is pollination aided by animals, wind, and water. The majority of pollination is cross-pollination with animal assisted pollination accounting for around 75%. Pollination is necessary for fruit development, seed production, and can result in better quality of some fruits (such as tomato). Almost all fruit and grain crops grown in the US require pollination (over 150 crops!) and crops dependent on pollinators are estimated by the USDA to be worth more than $10 billion per year. Pollinator decline is an area of controversy and concern, with the growing consensus being that it is not a singular cause, but a combination of multiple stressors leading to population declines. Pesticides, with a focus on neonicotinoids, are one of the most controversial contributors to decline. The concern with pesticides and herbicides is twofold: 1) the direct health implications of pesticides on pollinators and 2) the use of herbicides in cropping systems, which creates monocultures that poorly support pollinators by reducing the variety of flowering plants in the area. The issue with neonicotinoid insecticides is that they travel systemically throughout the plant, including to pollen and nectar, increasing the likelihood of pollinator contact. Loss of suitable habitats is another cause of concern. Urbanization and land conversion have contributed to loss of habitat. A combination of habitats is needed for food, nesting and mating areas, and migration. Urbanization has led to the fragmentation of habitats and the disruption of some migratory pathways. Land conversion from diverse natural landscapes to intensive cropping areas that are almost monocultures, decreases the variety of pollen and nectar sources for pollinators. Flowers vary in protein content and nutrient composition, so a diet of a singular plant species has the potential to impact pollinator health. Transportation of bees and an increase of commercial bee colony trade have contributed to the spread of parasites and diseases outside of the normal range. The spread of parasites and pathogens is problematic because the new host species often lacks resistance, increasing the likelihood of death. The impact of current and future climate change on pollinators is not yet well understood. Historically, changes in climate have caused the native ranges of plants and animals to shift to where conditions are more favorable. Many plants and pollinators have evolved to have a mutualistic dependency, so with potential range shifts there is concern that plant and pollinators will shift in different directions. Range shifts due to climate change have already been observed with some butterflies. Another concern is the alteration of bloom time and pollinator emergence. Climate change has the potential to lead to earlier warmer temperatures in the spring, which could disrupt the synchronization of flower development and pollinator emergence. There may also be increased potential for flower and bud damage due to increased frequency of late frost events if warmer temperatures come early. The good news is that urban landscapes have great potential to support pollinators, both as nectar and pollen sources and as pollinator habitats. Milkweed (Asclepias spp.) is the larval host plant for the monarch butterfly, meaning that milkweed is the only plant that monarch caterpillars feed on. Many plants and their pollinators have evolved together creating mutualistic dependencies. Milkweed contains toxins that are not harmful to monarch caterpillars, but are poisonous to many animals, providing protection for monarchs both as larval caterpillars and as adult butterflies. Butterflies have four life stages: egg, caterpillar, pupa, and adult; all of which have differing habitat needs. 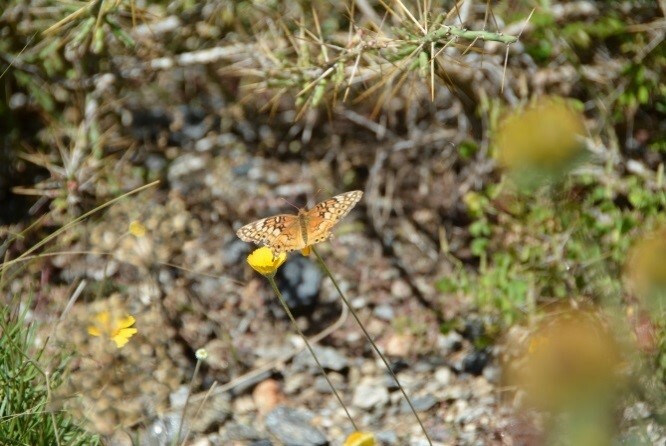 There are many habitat options for butterfly eggs including leaves or branches of various plants and the soil. Larval, or caterpillar, host plants are much more limited (for example Monarch butterflies and milkweed) and need to provide the caterpillar with both food and shelter. At the pupa stage butterflies need a protected area, such as shrubs, tall grasses, or fallen branches. 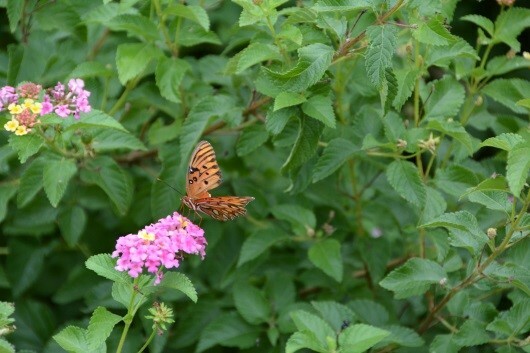 As adults, butterflies need plants that provide a nectar source. 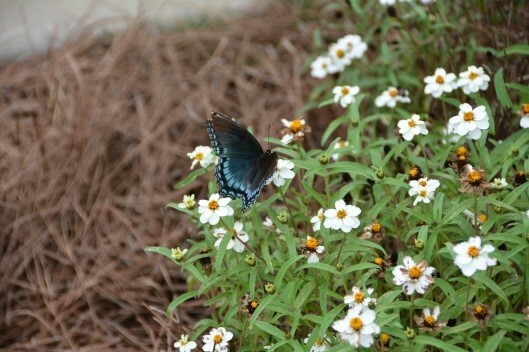 Butterflies are attracted to flowers that are brightly colored, open during the day and provide a good landing platform. Nectar is usually deeply hidden within the flower; however butterflies are able to use nectar guides to find nectar. Nectar guides are markings on flowers that are not visible to humans but can be seen by pollinators and direct them to nectar. 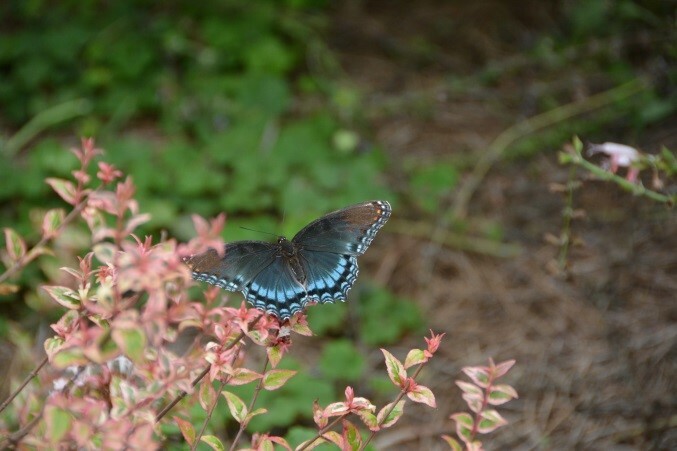 While some butterfly species migrate in the winter, others hibernate, requiring leaf litter, bark, or other landscape debris as cover. Moths can be either nocturnal or day-time pollinators depending on the type, with the majority being nocturnal and very important for the pollination of night blooming flowers. They are generally attracted to white or dull colored flowers that are heavily fragranced. Goulson, D., E. Nicholls, C. Botias, and E.L. Rotheray. 2015. Bee declines drive by combined stress from parasites, pesticides, and lack of flowers. Science 26 Feb 2015.